It's one of the most high-tech factories in the country, churning out parts for some of the biggest names in the car industry, and the result of a £50 million investment. 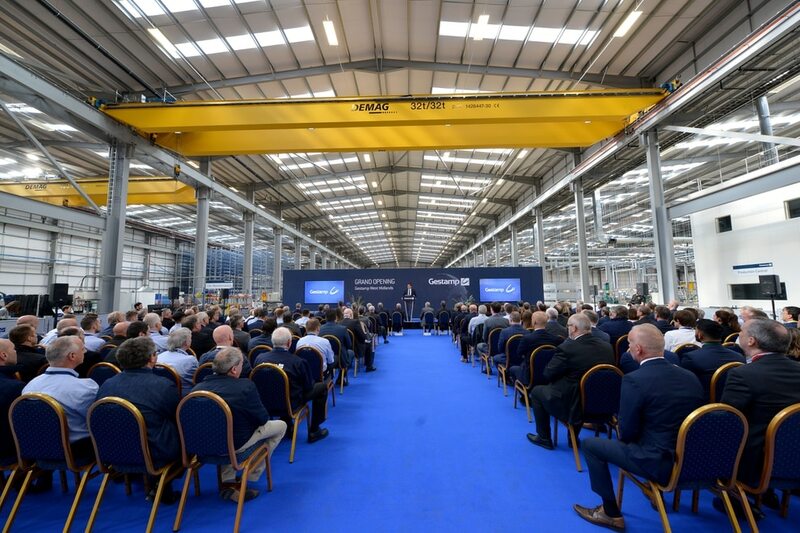 The new Gestamp West Midlands factory at Four Ashes threw open its doors yesterday to local dignitaries, customers and suppliers to show off its cutting edge manufacturing technology and the workforce that operates it. That included the biggest hot stamping manufacturing line in the country, producing up to eight components at a time after heating them to 930C before pressing them into shape as well as the first of a fleet of self-driving automatic fork lift trucks that will move parts around the factory floor. 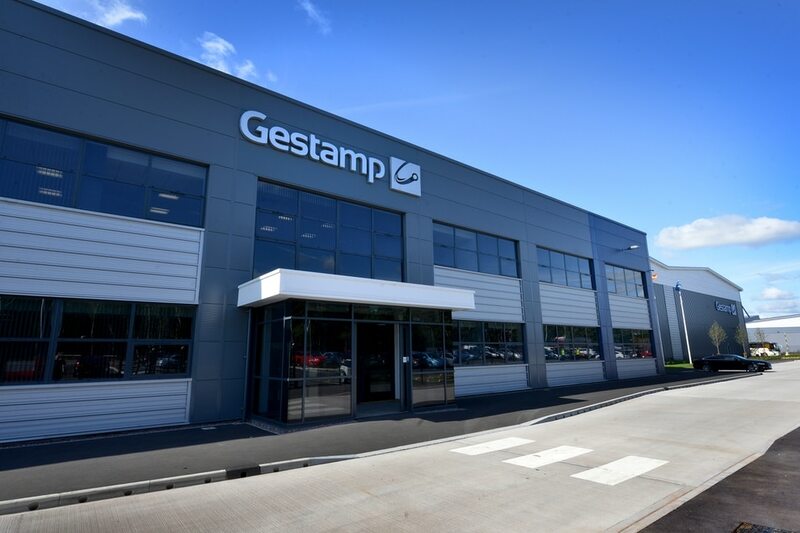 Four years after the team at Gestamp first came up with the plan for a new factory to replace its ageing plant in Cannock, which opened in 1965, the new site is already churning out parts for the biggest and best-known car companies in the world. 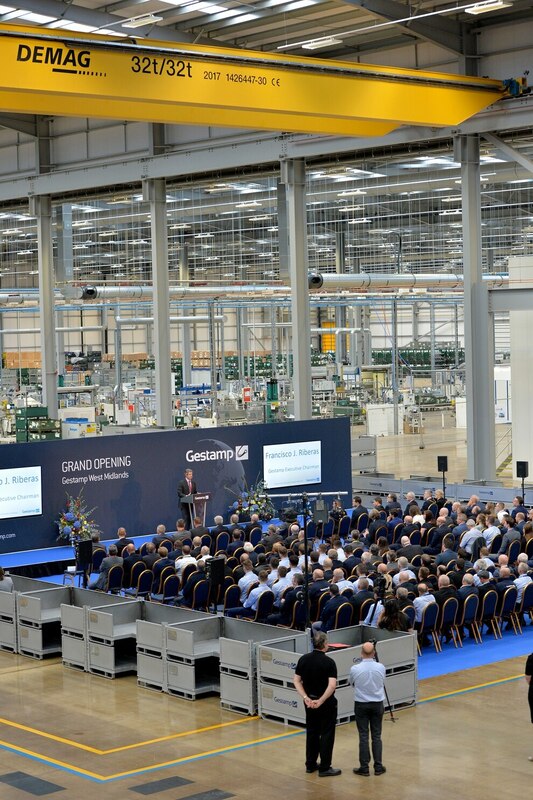 Official opening of new 50,000 sq m (540,000 sqft) £50m Gestamp car parts factory at Four Ashes. It will eventually replace the facility at Cannock and employ more than 800 people. Plant director Paul Felton talks to the assembled guests at the official opening of the new 50,000 sq m (540,000 sqft) £50m Gestamp car parts factory at Four Ashes. It will eventually replace the facility at Cannock and employ more than 800 people. Official opening of new 50,000 sq m (540,000 sqft) £50m Gestamp car parts factory at Four Ashes. It will eventually replace the facility at Cannock and employ more than 800 people. Pictured, executive chairman Francisco Riberas. 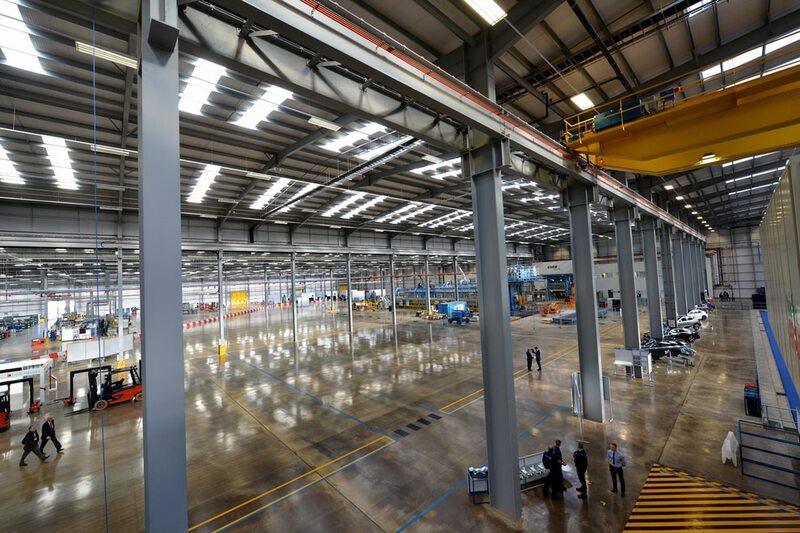 The vast new 50,000 sq m (540,000 sqft) £50m Gestamp car parts factory at Four Ashes. It will eventually replace the ageing facility at Cannock and employ more than 800 people. The giant presses at the new 50,000 sq m (540,000 sqft) £50m Gestamp car parts factory at Four Ashes. It will eventually replace the facility at Cannock and employ more than 800 people. Official opening of new 50,000 sq m (540,000 sqft) £50m Gestamp car parts factory at Four Ashes. It will eventually replace the facility at Cannock and employ more than 800 people. Pictured, the opening ceremony. And it will hit top gear later this year when it starts producing parts for a brand new vehicle that is still under wraps. Over the next two years it will take over from the Cannock plant and employ 800 people. 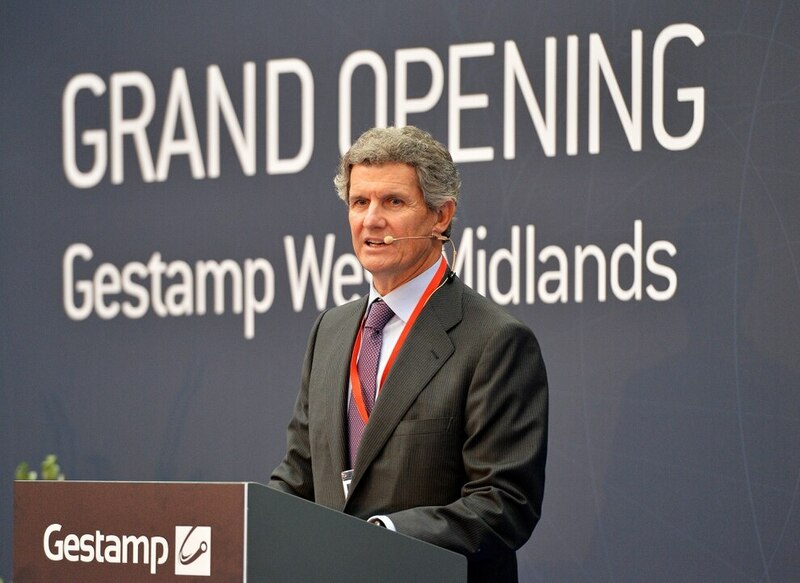 Paul Felton, plant director for both Cannock and the new Gestamp West Midlands (GWM) factory, says it will have made component sets for more than 300,000 cars by the end of next year - and production is set to rise far past that. 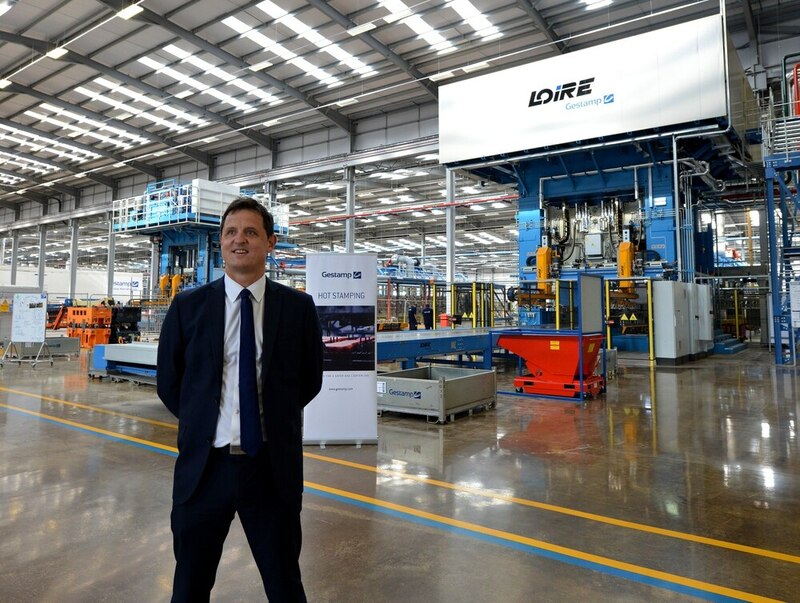 Turnover at the Cannock site is around £100m a year, making parts for JLR, Toyota, Nissan, Renault and BMW, but "over the next two years this site will overtake that, reaching £130 million," said Mr Felton. And if growth continues Gestamp can extend the factory by another 10,000 sq ms, to around 60,00 sq m, or 650,000 sq ft - roughly the size of eight football pitches. The year-long construction process took 45,000 tonnes of concrete and up to 500 people were employed on the site at one point. 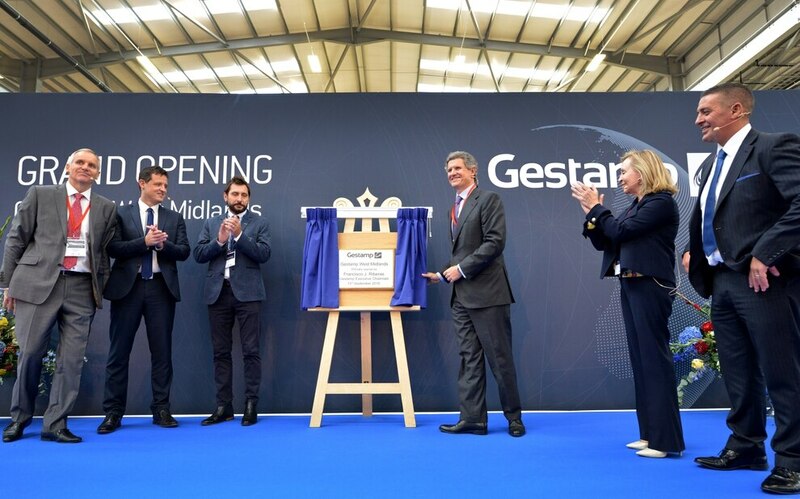 The purpose-built factory, completed last summer, represents a major investment by Spanish-owned Gestamp in both its British operations and the UK's car industry. Gestamp's executive chairman, Spanish automotic tycoon Francisco Riberas, said: "This new plant is more efficient and competitive. It is a customer-focussed factory with opportunity for further growth with both existing and new clients. "We will continue to help our customers and provide them with the latest technologies such as hot and aluminium stamping. We are already supporting them with the challenges that they face with electrical vehicles by providing lighter and safer solutions." The new factory was also hailed by Immaculada Lopez, the economic and commercial counsellor from the Spanish Embassy in London, who said it was an example of the "strong and increasing links" between Spain and the UK. The £7bn-a-year company, with more than 100 factories in 21 countries around the world, has pumped £200m into its UK operations since 2012 and now employs 3,000 British workers. 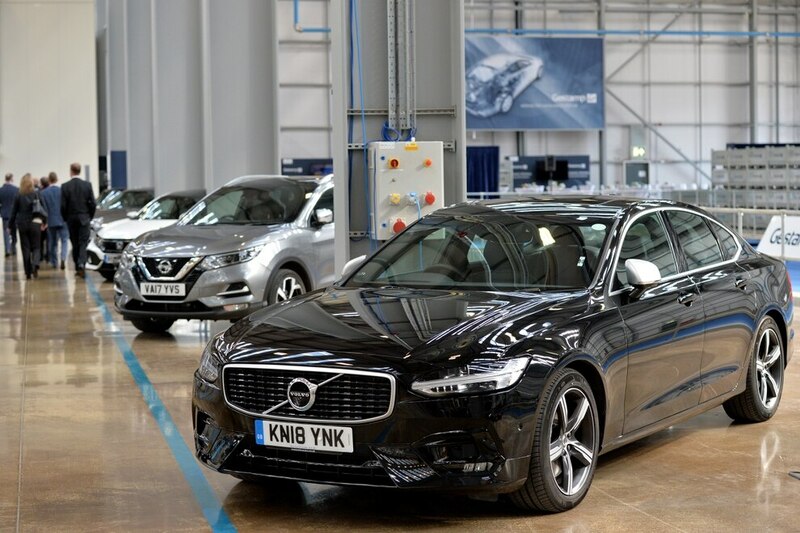 The new plant is designed to continue the work from the Cannock site and win new work on the latest cars, making lighter and stronger components for car bodies and chassis to protect passengers in case of collisions. 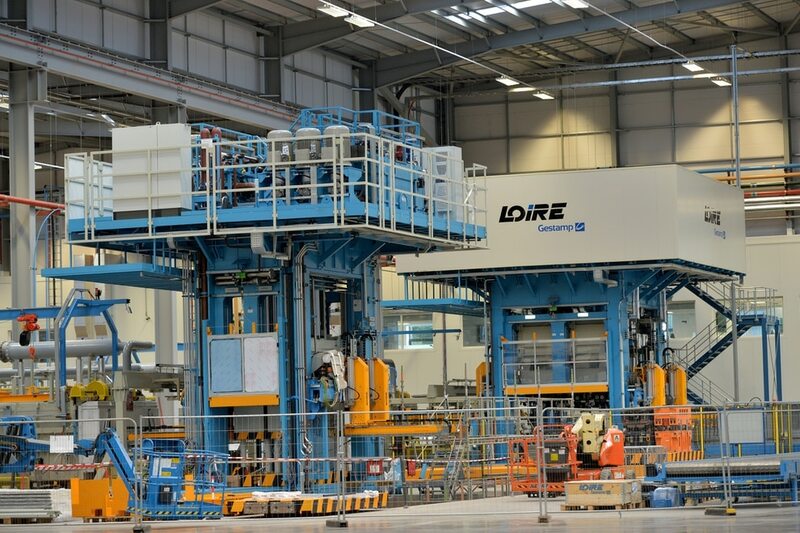 As well as its hot stamping and pressing machinery, the site has one of the latest servo cold presses, a 2,500 tonne capacity machine that will produce around 18,000 components this year. The factory is also equipped with a string of laser manufacturing cells to weld and cut components. The site makes parts in both steel and aluminium including new battery boxes for electric cars. Mr Felton said this would enable it to make parts for both hybrids and new fully electric vehicles, keeping the factory on the cutting edge of the latest trends in vehicle design and technology. Around 1,000 people currently work at the Gestamp site in Cannock, and Mr Felton said everyone was being offered the chance to work at the new site by the time Cannock closes in around two years time. He said the workforce would reduce to 800 through the use of agency workers, natural wastage and retirement. Meanwhile the company is also investing heavily in training, with around 85 apprentices spread across its seven UK sites, as well as a rolling programme of training for the company's entire workforce.